Guys, now we are going to share some cool information about Airtel’s official freebie plans. You can enjoy free Facebook, Whatsapp, Twitter and Youtube on your android smartphone. This trick is 100% working all over India and I have personally tested it in Maharashtra. After finishing free MB, you can reactivate this offer upto 5 times in a day. Again do the same task everyday to enjoy more free data. Visit this page and enter your Airtel prepaid mobile number > Press confirm button. Now, you will get all information about current mobile balance and status of free data. Just create new tab in same browser and open following links one by one to activate above plans. Again come back to your first tab (step 1) and refresh page. You will get activation details about freebie packs. I have a 4g internet pack on my airtel.. So should i try free youtube trick…or it will rewrite my data?? Use after your data plan validity expires. I only get one link in message!!!! And than I didn’t get any free intetnet!!! Which link i have to follow!!!!! There are 3 separate links. One for Facebook, other for whatsapp & last for Youtube. Choose what you want to activate from these 3 options & hit corresponding link. You can also activate all 3 one by one. THANKS! YOU ARE GENIUS GURU, I WILL GIVE IT A TRY. My youtube trick is not working but others are working. What should I do for youtube trial? 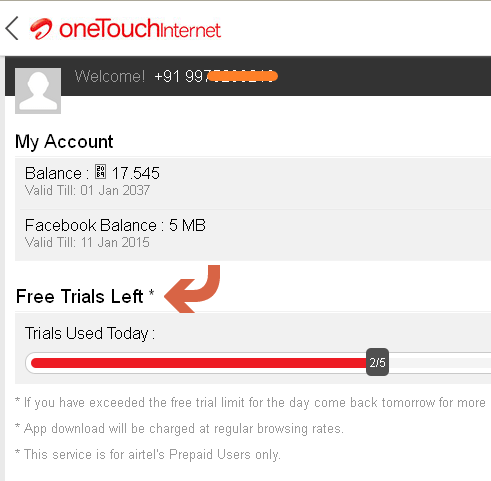 browse ‘One Touch Internet’ and register there with your airtel no.after registering you will get get free trials for fb,whatsapp,twitter and youtube on the front page. Hello sir, I have used Facebook, whatsapp ,youtube. But now I am unable to activate those three applications. I can only activate Twitter. What is the new problem . Can u tell me the solution for this problem? Superb trick…thank you very much…how to get daily update from this website?? Trial is activating successfully for the first time. Thank you so much, but this is not working twice in a day – From West Bengal. I tried it in Maharashtra 1 month ago and it did worked for me. Sir please tell whether it is working or not. I got the message. But when I connect, the main balance is reducing. Admin, I was able to get 100mb of youtube & it made me very happy, thanks.. But I couldn’t do the same for the second time.. Could u please help me with this matter. Bro I have sent you a link, please check it out. Bro now you will receive a link on your mobile. OK, I’ll send you. Sir, how can I check balance of my friends on any operator online ? but sir for ported number this link is not supported like docomo number converted into airtel number then it’s not working, so please sir provide solution of this query…..
and also provide link for all operators for checking balance.